Fast transfer speeds of up to 300Mbps let you stream audio and video to multiple devices without slowing down. Dual wireless bands (2.4GHz and 5.0GHz) help ensure fast Wi-Fi connections. Crossband technology helps maximize the simultaneous use of both bands to allow high-speed data transfer and uninterrupted streaming and gaming. 2 antennas help provide a stronger signal to reduce dead spots. Increases your Wi-Fi range by up to 7,500 sq ft to help ensure optimal coverage for your home or business. Plugs into most standard wall outlets for simple operation. Spot Finder technology works with your smartphone or tablet to help direct you on the correct placement for optimal Wi-Fi signals. Ethernet port allows wired connectivity. Connect your stereo system or speakers for digital music streaming from your computer or mobile device. Automatic speed sensing detects and configures the best Internet connection. Built-in LEDs let you see power, Wi-Fi Protected Setup and Ethernet link and activity at a glance. 128-bit WEP, WPA and WPA2 security features help ensure your information stays secure. Built-in firewall helps you control information received by and retrieved from your computer. 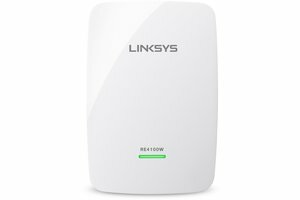 Learn how the Linksys RE4100W extends Wi-Fi range up to 7,500 sq. ft. Spot-Finder technology identifies optimal placement for the best results. Shop now. Helps eliminate dead spots in your home by extending Wi-Fi coverage up to 7,500 Sq. Ft.
Extends Wi-Fi range and connects an additional wired device. Stream videos and play online games without interference, thanks to transfer speeds of up to N300 Mbps + N300 Mbps. Plus, a Fast Ethernet port lets you create a reliable wired connection to a desktop or laptop computer or other Internet-ready device. The RE4100W extends the wireless coverage area of up to 7,500 square feet by repeating and redistributing the signal from the router to eliminate dead zones. It also features Crossband technology, allowing wireless bands to receive information on one band and transmit on the other to reduce dropped data packets. The result is a stronger, more reliable Wi-Fi signal, allowing you to stay connected on your mobile device or laptop from anywhere inside--or even outside--your home. Linksys Spot Finder Technology directs you on finding the right placement for the RE4100W, and it works on any smartphone or tablet. Simply follow the prompts to make sure you're getting the best possible Wi-Fi signal. • Connect stereo system or audio speaker to the range extender. • Connect to your Wi-Fi network to sync your mobile device with the range extender. • Stream your music from your smart device or computer.